Gareth Bale is now one of the highest-paid players in world football and an international star for Real Madrid and Wales. It has been an incredible rise for a young man who was playing schools football in Cardiff and with Southampton's academy little more than a decade ago, but his partner and soon-to-be-wife, Emma Rhys-Jones, has been with him the whole way. Bale's family continue to live a quiet, private life, but here is what we know about their relationship. Very little is known about Rhys-Jones, who has stayed out of the spotlight and kept away from social media despite Bale's huge global profile. 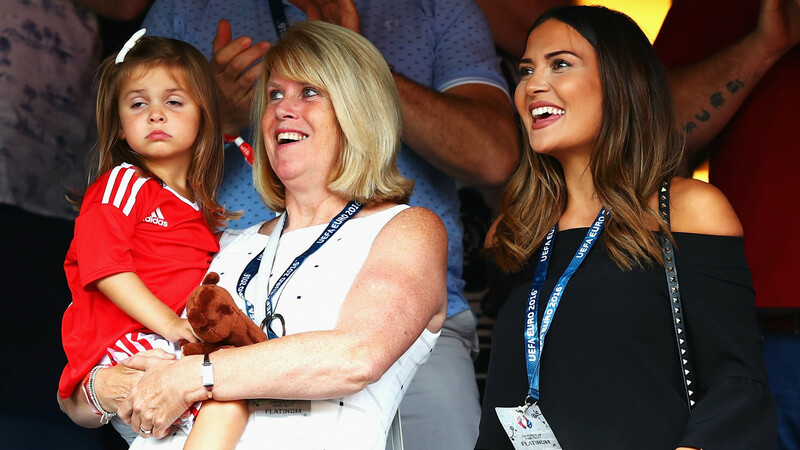 It has been said that she was a hairdresser in Cardiff as Bale was making his name, and she may now be focusing on spending time with the couple's two young daughters, Alba and Nava. HOW OLD IS EMMA RHYS-JONES? Rhys-Jones' birth date has been listed as July 29, 1991, making her 25, but that is not confirmed. Bale was born on July 16, 1989 and it is unlikely they are separated by more than a couple of years as they met at school. HOW DID SHE MEET GARETH BALE? Bale and Rhys-Jones are high-school sweethearts and began dating sometime in the early 2000s while attending Whitchurch High School. Emma is said to have been raised in Llanishen, a district in north Cardiff a couple of miles from Bale's family home. She has been at his side ever since but, as mentioned, keeps a very low profile and is only occasionally seen on Bale's Instagram and Twitter accounts. Rhys-Jones gave birth to the couple's first daughter, Alba Violet, at the University Hospital of Wales on October 21, 2012 and their second daughter, Nava Valentina, on March 22, 2016. Bale announced a day after his 27th birthday last year that the couple had got engaged. The wedding looks set to take place this summer, with the Sun reporting that they initially considered holding it in New York so that Emma's jailed father, Martin, could attend before learning that he could be released early. Martin Rhys-Jones was convicted of fraud in the US but may be freed in June, dependent on good behaviour, and the ceremony is likely to take place in Wales as a result.